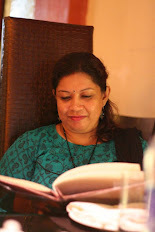 in Combo Menu, comfort food, Festive recipe, Indo-chinese, No onion-garlic, North Indian recipes, regional recipes, Veg. Today's meal is simple, healthy and at the same time finger-licking delicious. 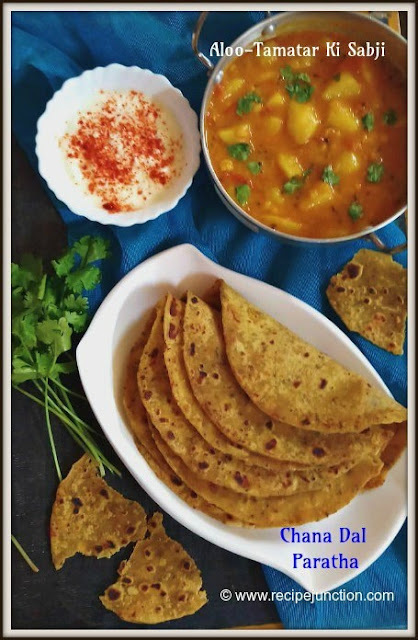 The combo is Chana Dal Paratha and aloo-tamatar ki sabji, which is best combo with puri or parathas. 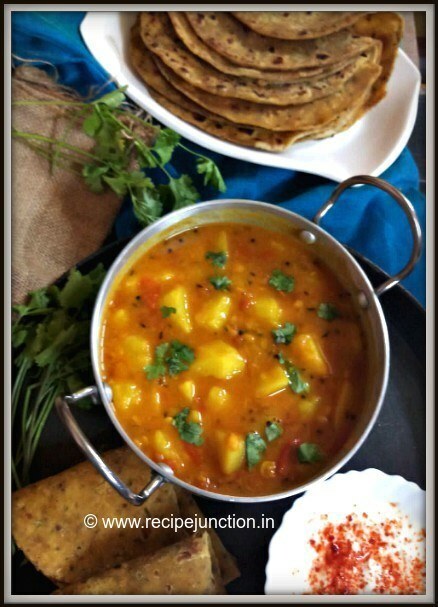 The not-so-spicy chana dal paratha goes very well with this tangy aloo ki sabji. This is also a no onion-no garlic meal, which you can cook up during fetsival time. 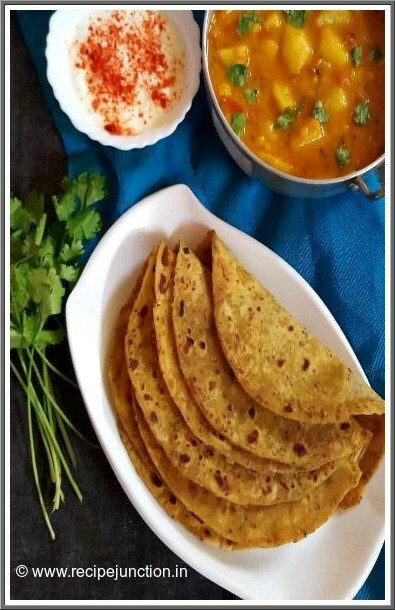 Chana Dal Paratha : A paratha is an flatbread that originated in the Indian subcontinent. Paratha is an amalgamation of the words parat and atta which literally means layers of cooked dough. It's very popular in Northern region of India. There it is served in almost every meal. There are numerous varieties of Parathas available in India, the procedure also differs from each other. Parathas are usually stuffed with vegetables, like cauliflower, potato, leafy vegetables, radishes and/or Paneer. The possibilities of combination can be endless. This is not stuffed paratha but the dough is made with boiled chana dal(Bengal Gram) along with some selected spices and whole wheat flour. Hence it is totally hassle-free and quite healthy and wholesome. It is good to pack for kids' as well as adults' lunchbox. In a bowl, take boiled dal and mash well with the back of a ladle. In there, add flour (I use whole wheat flour and all-purpose flour in 2:1 ratio) , salt, oil, Turmeric, Cumin and red chilli powder, ginger Paste and kasuri methi. Mix everything together, with the help of little water make a pilable dough. Keep it aside for at least half an hour. Make small round balls from the dough. Spread each ball into a 3-4" diameter paratha. Heat a tawa on medium flame, place a paratha on the tawa, wait for a minute, turn to the other side. Pour 1 tsp. oil around the paratha and nicely coat the oil on side of the paratha. Lower the flame from medium to low and fry on both sides until both sides are light brown in color. Flatten other balls like this way and prepare parathas. Chana Dal Parathas are ready. 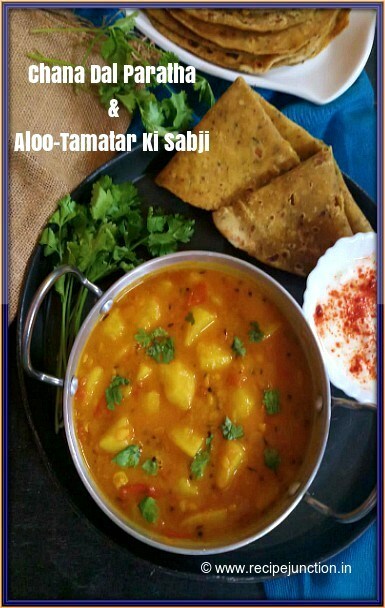 Aloo-Tamatar Ki Sabji : This aloo-tamatar ki sabji is very simple-to-make but taste so exotic. It's tangyness will bowled you over. Cumin seed powder : 1/2 tsp. Boil potatoes whole and peel once cooled. Cut into small cubes. Grind tomato, green chilli and ginger to make a fine paste. Take some oil in a pan and heat. Add asafoetida and cumin seeds when oil is hot. Immediately, add turmeric powder, coriander powder and red chilli powder and 2 tblsp. water. Stir nicely with a spoon (masala should not burn). Now add tomato paste in the masala and saute until oil leaves the side of the pan. Crumble the potatoes into medium pieces (for this particular sabji, we crumble the boiled potatoes, can add cubed one too) and add in this masala and mix well with the masala. Add 1 tsp. sugar now. Let it melt in the curry and add 1 glass of water. Season with salt according to your taste. Cook for 3 to 4 minutes till gravy thickens a bit. Sabzi is now ready. Remove from heat and sprinkle chopped coriander leaves. Hope you all like try this combo at home and will like it. If you try out any of my recipes and like it, please click a pic and send me in e-mail mentioned in my profile on my homepage. Labels: Combo Menu, comfort food, Festive recipe, Indo-chinese, No onion-garlic, North Indian recipes, regional recipes, Veg.